Home Migraine Neurology Migraine, What Is It? Migraine is a severe headache, usually on one side, often accompanied by nausea and vomiting and associated with finding light or sound painful (photophobia and phonophobia). Migraine with aura (classical) - the headache is preceded by a preliminary phase called an aura, when symptoms such as seeing flashing lights, temporary visual loss, speech problems or numbness of the face or arms may occur. Both types of migraine may frequently start with changes in mood and feelings of general hunger or particular food cravings. 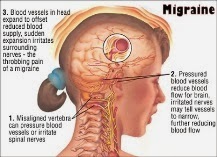 The precise cause of migraine is unclear, but changes in the size of blood vessels and the levels of neurotransmitter substances (chemical messengers) in the brain are thought to be responsible. In particular, a drop in the levels of the brain chemical serotonin is believed to be responsible for the dilatation (widening) of the blood vessels that causes the throbbing headache. Being a migraine sufferer seems to run in families, and so although migraines are not directly inherited there may be a genetic link. Migraine can't be cured but it can be kept under control, limiting the number of attacks and/or their severity. Treatments include painkillers, possibly combined with anti-sickness medication, or a group of medication called triptans or 5HT agonists which are not painkillers but work on changes in the brain chemical serotonin thought to be at the root of the blood vessel dilatation in migraine. Other drugs are also used in migraine, such as betablockers, neuromodulators and low dose anti-depressants. Some people find acupuncture, osteopathy, yoga or relaxation helps. The use of botulinium toxin injections has now been approved for treating chronic migraine. How the toxin works isn’t fully clear but it’s thought to affect the complex neurological pathways involved in migraine and it can be very successful, especially where other treatments have failed.